I like the idea of using Google Drive. I have unlimited capacity, I can get to it anywhere, but I just wish I could open Photoshop files directly from my Drive. Oh, wait! Now I can! First you must install the Google Drive app to your computer (PC only, not for Mac). You can download it here. Next. configure it and get it synced up with your account. Next you must install the Application Launcher for Drive extension from the Chrome Web Store. You can get it here. Now we're ready to work! 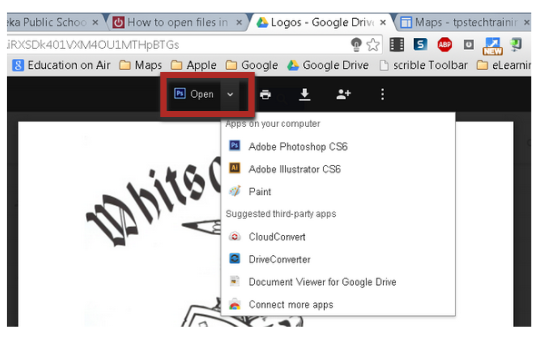 Open Drive and find a non-Google file. Perhaps a Word file, Photoshop or Illustrator file. Double click it to open it. This will open it in Preview Mode. Click the popout icon to open it in a new window. At the top you will see "Open" with a down arrow beside it. Normally this only allows you to open associated web apps, but here you'll see desktop applications instead. Because the file below is an Adobe Photoshop file, you will even see the Photoshop logo beside it. Google Drive just keeps getting better and better!!! Yes, there is also a way to save files directly to your Google Drive from all desktop applications, but that is a topic for another post!! Stay tuned.